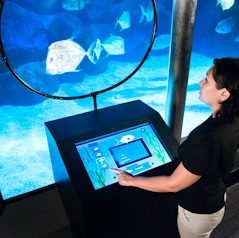 The Virginia Aquarium & Marine Science Center has installed a new interactive exhibit, dubbed “Fish and Chips”, that uses RFID technology to instantly provide visitors with information on the aquatic life as it swims by, according to Breaking News Travel. Similar to identification technology that is used in household pets, a tiny microchip is injected under the fish’s skin. As the fish swim by an RFID antenna “pings” and instantly provides information on the species, habitat, range and other interesting facts on a computer screen for the visitors to read. Using RFID also allows aquarium staff to monitor the health and better perform veterinary procedures since the fish are more easily tracked and identified. The Virginia Aquarium had already been using RFID technology, but not until recently did the implementation support for in-water identification. For more information on the “Fish and Chips” RFID permanent exhibit and for more information about the Virginia Aquarium or the facility’s research and conservation efforts, click here.